But since there are so many fish oil supplements available, how do you know you are selecting the right one for you? We’ll make it easier for you by talking about our number one choice: Dr. Tobias Omega 3 Fish Oil capsules. 1,400 mg Omega-3 Fatty Acids per serving (2 caps). Fish oil supports the health of heart, brain health and joints. Enteric coating to help absorption of essential fatty acids. Enjoy Health Benefits Without Fish Burps. Our fish oil is purified with molecular distillation. Why would anyone want to consume anything that sounds like fish oil? Even if you are a seafood lover, “fish oil” just doesn’t seem appetizing. However, we get a number of health benefits from fish oil since it is highly rich in Omega 3s. Omega 3s are fatty acids, which are a source of “healthy” fats that are crucial to bodily functions. Read on to learn more about the various benefits of fish oil, and how it helps the human body. Brain Benefits – Fish oil has been proven to benefit and help the growth, development, and overall function of the brain. Additionally, the neuroprotective properties in fish oil have also been proven to reduce neuro-aging of the brain, and even the pathological decline often seen in the elderly. Omega-3s also have antidepressant properties. In fact, another study discovered that people who consumed more Omega-3s had more gray matter brain volume and the most new tissue development, which is often found in the “happy” part of the brain. Visit this site here to read more about the research behind the purpose and role of fatty acids in the human body. Controlling Cholesterol – For those individuals who are struggling with cholesterol levels, consider adding more fish oil into your diet. You may have heard from medical professionals that fish oil can help combat against heart disease. In fact, the American Heart Association (AHA) recommends eating fish (particularly fatty fish such as mackerel, lake trout, herring, sardines, albacore tuna, and salmon) at least twice per week to significantly decrease risk for heart disease and to also help control cholesterol levels. Watching Weight – Here is something most of us need help with: watching and/ or losing weight. A key element in weight loss and weight management is diet. By making adjustments in your diet, you may be surprised at how quickly you shed excess pounds. Fish oil is a helpful supplement that can help you to reach your weight loss goals. There have been several studies that have monitored the effects of the fish oil supplement and weight loss. Fish oil contains various mechanisms including increased fat oxidation, the suppression of fat deposition, and even appetite suppression, which can all aid in weight loss. Visit this site here to read more research on the role Omega-3 fatty acids play on weight loss and weight management. Diabetes Diets – Polyunsaturated fats, which is found in Omega-3s have proven to reduce the risk of Type 2 diabetes in several studies. Diets rich in Omega-3 fatty acids may decrease insulin resistance in those with diabetes. Numerous others studies have shown that fish oil supplements can help to reduce triglyceride levels in people with Type 2 diabetes, which could also lower their risk of heart disease. Learn more about Type 2 diabetes and how fish oil has proven to lower diabetes risks. Easing Arthritis Pain – Omega-3 fatty acids can help to protect against inflammatory cytokines and prostaglandins, ultimately reducing inflammation and morning stiffness, which those who suffer from arthritis know all too well. Fish oil also helps to reduce inflammation and morning stiffness. However, it is difficult for the average human to consume a sufficient amount of Omega-3s simply due to the amount of fish needed to meet the recommended serving. This is why it is recommended to treat arthritis-related conditions by taking fish oil capsules with at least 30 percent active ingredients. It is also worth mentioning here that Fish oil helps greatly in alleviating pain caused by neuropathy. A lot of doctors recommend taking Omega 3 supplements for neuropathy. Pregnancy Protection – Pregnant women are often cautioned against consuming high amounts of fish during their pregnancy due to the high levels of mercury in some fish, such as tuna, which can prove to be problematic for the baby. However, new research has discovered that only 27 percent of pregnant women are getting enough Omega-3s, which are important for the baby’s visual and cognitive development. Additionally, fish oil has proven to help women cope with the pregnancy itself. For example, fish oil can be used to help treat acne breakouts, reduce the risk of birth defects, help ease labor and delivery and even help to produce breast milk, post delivery. Check out this study about how fish oil can help pregnant women, pre and post delivery. Battling Blood Pressure – As we mentioned above, the Omega-3 fatty acids in fish oil have a number of properties that help significantly lower cholesterol and heart disease. In addition, taking fish oil supplements—and also dieting and exercising—also helps battle high blood pressure, which also help to significantly reduce the risk of heart disease. Visit this site here to read more studies on the effects of fish oil on blood pressure. Acne-Fighting Agents – Many people have claimed that fish oil have helped them clear up their skin faster, and even help reduce the appearance of acne scars. Although there are no successful clinical trials that have shown that fish oil is a cure for acne, scientists have proven that Omega-3 fatty acids help reduce inflammation, which is a huge contributor to the appearance of acne. In small studies, researchers have found that most participants with moderate to severe acne experienced a decrease in the severity of acne after taking fish oil supplements for approximately 12 weeks. Learn more about the research behind fish oil and acne here. Does Fish Oil Cause Any Side Effects? Many individuals who are considering taking fish oil on a regular basis often ask if it causes any side effects. Because fish oil is a dietary supplement, it can affect users differently. For example, users who are allergic to shellfish or seafood of any kind should avoid taking fish oil, not because it’s dangerous, but because he or she is allergic to the chemical properties already in fish. Again, because every person is different and reacts to dietary supplements differently, users may experience other side effects not included in the above list. If users notice any harmful or uncomfortable side effects, such as fever, chills, chest pain or even flu symptoms, then it is recommended to seek emergency medical attention as these could be signs of an allergy. What Fish Oil Brands Work Best? Dr. Tobias Omega 3 Fish Oil – Two of the main active ingredients in fish oil supplements are DHA and EPA. After reviewing several other brands, Dr. Tobias Omega 3 Fish Oil capsules contain three to four times more Omega-3s. In fact, a single serving (two capsules) of Dr. Tobias Omega-3 fish oil provides 600 mg of DHA each day, which is also the recommended amount of Omega-3s we should consume on a regular basis. Fish oil supports the heart health, brain health, joints, mental state and cognitive health, and can even help improve the health of skin and hair. Another reason why we love Dr. Tobias Omega-3 fish oil capsules is because this supplement brand doesn’t leave a fishy aftertaste, which is a common complaint among most fish oil users. Dr. Tobias’ fish oil capsules have an enteric coating which helps to increase the absorption of the fatty acids, and which also avoids the fishy aftertaste. 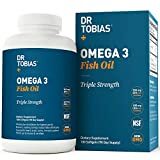 While we believe that Dr. Tobias Omega 3 Fish Oil capsules are the best fish oil supplements you can find, there are a number of others on the list that are worth trying. Read on to check out some additional reviews below. Nature Made Fish Oil supply only comes from deep ocean waters, not farm raised fish. No artificial colors; No artificial flavors; No artificial preservatives. The Omega-3’s in Fish Oil may reduce coronary heart disease risk. Suggested use: take 2 softgels daily with a meal. 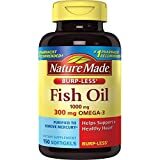 Nature Made – Burpless Fish Oil – Nature Made’s brand of fish oil is another fish oil supplement worth trying. Nature Made fish oil is made from deep ocean waters rather than from farm-raised fish. This supplement is 100% natural without the presence of any artificial coloring, flavors or preservatives. Users who have used Nature Made Fish Oil have claimed that it has helped them with acid reflux, and did not cause any burping (a common side effect of fish oil supplements) nor did it give them a fishy aftertaste. While some users have claimed that this product is a bit pricier than other brands, it also delivers and is high quality. Contains Fish (Anchovy, Herring, Salmon, Sardine and Sprat) and Soy. State of the art molecular distillation process. 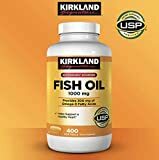 Kirkland Signature Fish Oil – The Kirkland brand of fish oil another natural supplement that is made from fish from real ocean waters, not farm-raised fish. One of the best points about this supplement is that Kirkland’s brand tells users what is really in their product. The Kirkland brand also does not contain cross-contamination with other types of fish, which is a problem with other brands. Additionally, frequent users of this product have also claimed that fish oil has helped them sleep, stay emotionally balanced, and does not have a fishy aftertaste. In conclusion, fish oil provides numerous health benefits to the human body, most importantly supporting the health of the heart and brain. Numerous researchers and scientists have studied the effects of fish oil on human health over the years, however, more and more recent studies are uncovering more benefits to taking fish oil. As a result, medical professionals and health care providers are recommending fish oil supplements for users who have a history of strokes or other heart problems, to help aging in the elderly, and even help reduce the risk of Type 2 diabetes. Even if you aren’t keen on the idea of consuming fish oil, there are too many reasons not to try it. Take control of your health, and considering taking fish oil supplements today for a healthier tomorrow.